A blood clot in the thigh disrupts normal blood flow through the affected leg, which can lead to serious complications. Most thigh blood clots occur in the deep veins, a condition known as deep venous thrombosis (DVT). Less commonly, a clot can form in a thigh artery, depriving the leg of oxygen-rich blood. A DVT thigh clot disrupts blood flow out of the affected leg, whereas an arterial clot blocks blood flow into the leg. There is some overlap in the symptoms of arterial and venous thigh blood clots, but distinct differences distinguish the two conditions. A DVT thigh clot may cause vague leg pain, although this symptom is often absent. Among people who experience pain, it is usually achy in nature and may gradually worsen over time. The pain may be felt only in the calf if the clot is near the knee. Pain in both the calf and thigh can occur with a DVT clot higher in the thigh. The area over a DVT may be tender when touched, but this symptom is also absent in many people. An arterial thigh clot characteristically causes severe pain that comes on abruptly. The pain is typically much more intense than with a venous thigh clot. Tenderness of the leg muscles occurs due to damage caused by oxygen deprivation. The specific muscles affected depends on the location of the clot in the thigh. The skin over a thigh DVT clot may be red and warm due to local inflammation. These signs are often absent, however. With a large venous thigh clot, the entire leg below the level of the clot may appear slightly blue or purple due to obstructed outflow of blood from the leg. With an arterial thigh clot, the skin below the level of the clot is characteristically pale due to reduced flow of blood into the leg. The lack of arterial blood flow also causes the involved area to feel markedly cold to the touch. Contrasting findings with regard to skin discoloration and temperature help differentiate a venous thigh clot from and arterial clot in the same location. A DVT thigh clot can cause other symptoms that do not occur with an arterial clot. 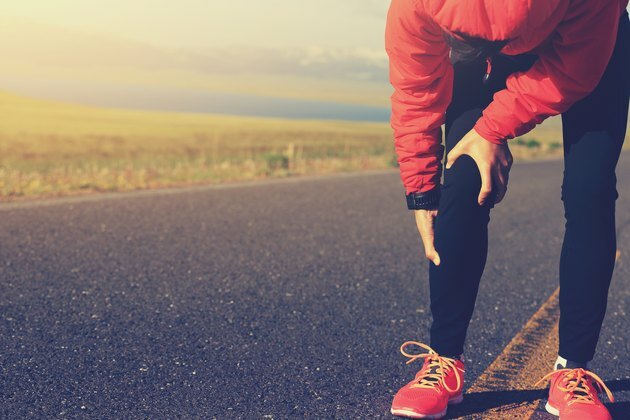 Since a clot in a deep thigh vein obstructs blood flow out of the leg, a backup occurs that commonly leads to swelling, or edema, of the affected leg. With a DVT clot near the knee, edema may be limited to the lower leg. Thigh and lower leg edema often develops with a DVT clot in the upper thigh. The obstruction of venous outflow can also cause engorgement of the superficial leg veins, making them much more prominent in the affected leg. With an arterial thigh clot, the leg below the clot does not receive an adequate supply of oxygen-rich blood. The oxygen-deprived tissues subsequently malfunction and can die if blood flow is not restored. Several symptoms related to oxygen deprivation occur with arterial thigh clots but not DVT thigh clots. Malfunction of oxygen-starved nerves causes abnormal sensations, such as burning or tingling below the level of the clot. This can progress to a complete lack of feeling if the nerves begin to die. The area below the clot can also become paralyzed. Lack of pulses below the level of clot is another key finding with an arterial clot. With an arterial thigh clot, pulses in the affected knee, ankle and foot are characteristically absent. An arterial thigh clot is also a medical emergency, as blood flow must be restored quickly to avoid permanent tissue damage and possible loss of the leg. Reviewed and revised by: Tina M. St. John, M.D. Rush University Medical Center Review of Surgery, 5th Edition; Jose M. Velasco, et al. What Are The Symptoms of Blood Clots in The Leg?